beyerdynamic presents the CUSTOM ONE PRO – the premium headphone that completely adapts to the user, both in terms of sound and style. Every day is different, and so is every genre of music. Sometimes you want driving beats to provide your day with rhythm, other times you need quiet sounds to help you relax and unwind – at home or on the go, in loud or in quiet environments. The requirements often change hour to hour. beyerdynamic, the audio specialist from Heilbronn, Germany, has developed the perfect headphone for this kind of flexible lifestyle: CUSTOM ONE PRO lets you listen to music interactively. The first model of the brand new CUSTOM series changes its sound characteristics in the blink of an eye – from clear analytical sound to booming colourful beats and back in less than a second. The style is just as flexible: The style kits, which are available as accessories, make it easy to give your headphones a new look with just a few quick movements. You can change your headphone’s look at any time, even long after the initial purchase. The CUSTOM sound slider is your tool for maximum listening customization: Flexible bass reflex vents on the earcups change the headphones’ sound characteristic in four stages. When the vents are closed, they keep the transducer membranes under strict control, which produces a streamlined, analytical sound. However, with every notch on the slider, the CUSTOM ONE PRO adds another layer of bass until the wearer can literally feel the air pumping out of the headphones thanks to the ultra-light velocity transducer. The result is thundering bass of unimaginable proportions, primarily because there is no equaliser in the amplifier to manipulate the frequency. The CUSTOM ONE PRO delivers this powerful sound on its own, without difficulty and without distortion. The throbbing beat machine can just as quickly be turned into sophisticated headphones for your home stereo system. Or a control monitor for listening in on a jam session in your rehearsal space. Perfectly in-tune with every mood and every musical genre: this is the result of beyerdynamic’s decades of experience as a studio and stage audio equipment supplier. A side effect of the innovative sound slider: It transforms the CUSTOM ONE PRO incrementally from an open to a closed headphone. Noise pollution, such as droning airplane engines or street noise, is kept out and is no longer a source of irritation. Moreover, this noise isolation feature is much more pleasant than electronic noise-cancellation. There is no uncomfortable feeling of pressure against your ears and the headphones do not require additional batteries. The newly developed 16 Ohm drivers from our professional line of accessories ensure a high degree of efficiency and a maximum volume of 116 decibels. The membranes are some of the lightest in the world and transform the power of the neodymium magnets into pure sound without distortion. Inefficient mobile devices such as smartphones or MP3 players can now play in peak form, while this powerful drive teases the finest details out of your stereo system at home. The CUSTOM ONE PRO offers not only personalised sound, but also personalised design. This began in the development stages: On Facebook, in online forums and on the beyerdynamic website, users were asked to vote on the headphones’ appearance. 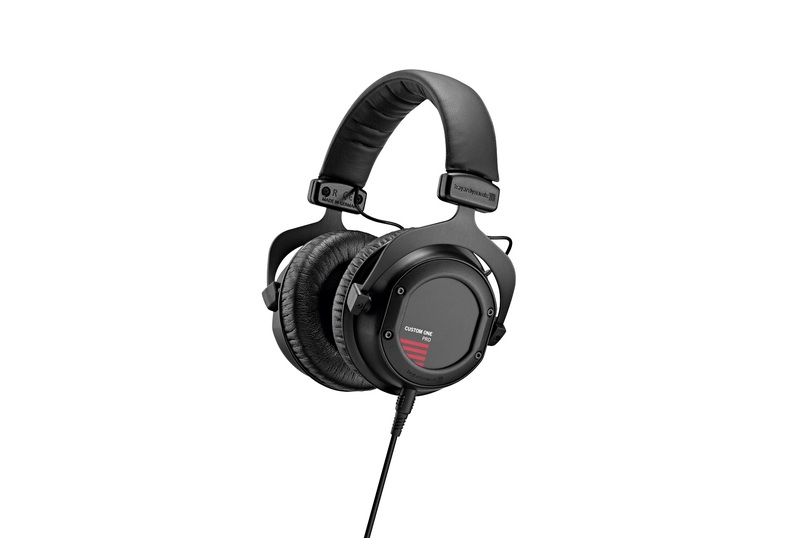 The result is a truly professional look: The CUSTOM ONE PRO (199 €) comes in matte black with a few subtle red accents. This outfit is a clear signal that this is a serious headphone and it isn’t just a toy. The fun is only just beginning with the first model. Starting in September, every headphone can be personally styled on the beyerdynamic website (www.beyerdynamic.com/custom). The rings, covers and cushions on the ear pads are interchangeable, as is the cushioned headband – and not only when you are ordering your headphones, but also at any time afterwards. The additional personalised parts cost anywhere between 5 and 50 € and ensure that your headphones will have your own unique look. The user can switch the parts easily by hand in just a few simple moves. The CUSTOM cable also offers the highest level of flexibility and can be modified just as easily as the rest of the headphone. Various lengths and designs or a headset function with a gooseneck microphone – anything is possible. The special locking device holds the cable securely in position, even when things start to heat up on the street or when DJing in the club. In other words, professional quality that is “Made in Germany” has never been as exciting as with the CUSTOM ONE PRO. Welcome to the world of sound styling! The CUSTOM ONE PRO will have its debut at the IFA in Berlin (31/8 to 5/9/2012) in Hall 1.2 at Stand 144. The headphone will be available for purchase from specialist retailers as well as at www.beyerdynamic.com starting in the middle of August 2012. Scholar, musician, gamer, and IT nerd. Always in love with learning more about any and everything.